SOUNDS AUSTRALIA IS PLEASED TO ANNOUNCE THE FULL LINE UP FOR THE AUSSIE BBQ AND TWO BIG SOUND GALLERY SHOWCASES AS PART OF SXSW 2016, FEATURING 30 OF AUSTRALIA’S MOST EXCITING NEW ACTS LOOKING TO PAVE THEIR WAY ON THE INTERNATIONAL STAGE. Now in its 13th incarnation at South by Southwest (SXSW), THE AUSSIE BBQ will see Brush Square Park’s East Tent transformed into a smorgasbord of antipodean musical talent from all across the country on Friday 18th March. SOUNDS AUSTRALIA are always looking for innovative ways to present the Australians performing at THE AUSSIE BBQ during SXSW and this year is no different. For the first time in SXSW history SOUNDS AUSTRALIA will bring in a second stage to the well known Brush Square Park East Tent allowing them to showcase 16 of Australia’s best emerging exports under the one roof from 12.00pm to 8.00pm. A must-see event for both music fans and professionals alike, the reputation of THE AUSSIE BBQ as one of the key platforms for discovering new Australian talent continues to grow throughout the world. Taking place at Brush Square Park’s EAST TENT on Friday 18th March, sausages will once again sizzle as top tier tastemakers and industry gather to witness some of our finest home grown talent. With thirty Australian acts showcasing throughout Austin over SXSW and with the need to create additional opportunities for the Australian artists participating in SXSW, SOUNDS AUSTRALIA have carefully curated two additional SOUND GALLERY showcases. Taking place at B.D Rileys on Tuesday 15th and Saturday 19th March, SOUNDS AUSTRALIA will present the following artists in the famous 6th Street venue. In addition to showcasing opportunities SOUNDS AUSTRALIA will support the efforts of the Australian music industry heading over through the management of the tradeshow, a networking lunch and Country Connections; market education and export networking for companies from the international contingents attending SXSW 2016. 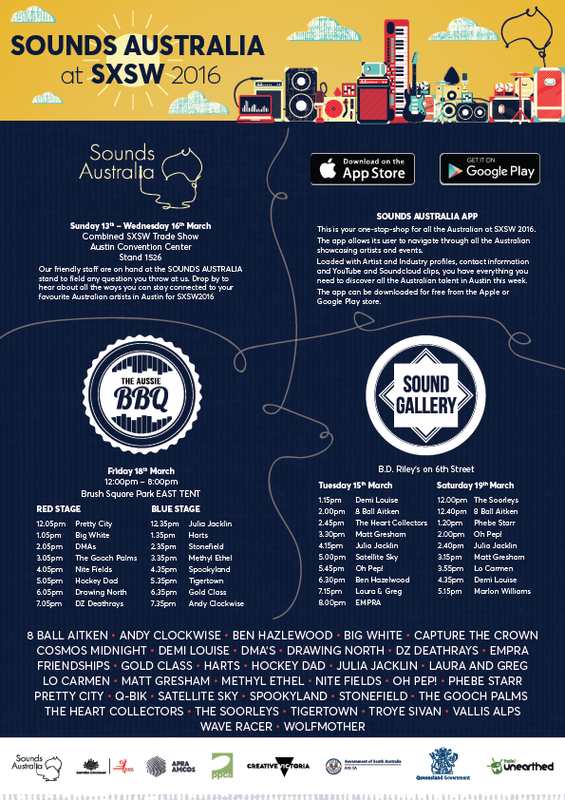 For full details on all the Australians performing at SXSW, including playing times download the free SOUNDS AUSTRALIA app from the App Store or Google Play.